As an experienced nondestructive testing lab, Jesse Garant Metrology Center understands the importance of part inspection for quality metalcasting. We have the greatest diversity of industrial CT systems in North America, including an exclusive high-energy system for faster mid-size part inspection, along with a full suite of x-ray and 3D scanning systems. We provide a repeatable and straightforward inspection process with accurate and unbiased data for all stages of manufacturing. Our diverse systems can handle testing of a wide range of castings made from a variety of materials. These include die cast, sand cast, forgings, and investment castings made from both ferrous and non-ferrous materials like aluminum, titanium, Inconel and brass. No other NDT method can compare with the speed and versatility of industrial computed tomography for internal inspection of castings during pre-production. 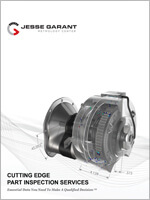 CT data can be used for internal metrology of complex dimensions for First Article Inspection. For clients that only require external measurements, 3D scanning is another feasible option. 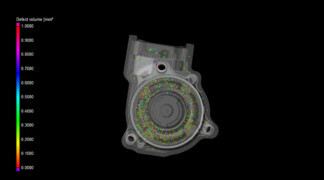 Industrial CT scanning can also qualify high value castings in must run conditions for production inspection. We can inspect low to medium volume production castings using either CT or industrial radiography. For large volume inspection of castings, our industrial x-ray services provide definitive data for reintroducing good parts back into production from quarantined lots. We work with our clients to develop a customized process for each lot with traceable and repeatable testing. Advanced nondestructive testing methods like industrial computed tomography are able to identify and characterize internal casting defects like gas porosity and shrinkage defects. Critical CT data can be used to qualify castings, identify areas prone to weakness, and revise designs for improved part iterations.